We've been watching a pigeon nest for several weeks, spying on the two small white eggs that rested comfortably in the straw filled hollowed out bed. The parents picked a perfect spot to make a home for their family. 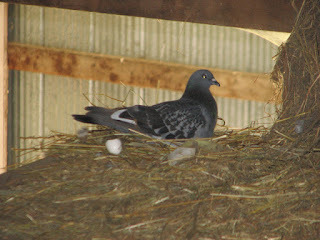 At the edge of our indoor hay loft, the pigeons fly through the big sliding barn door and land on the edge of the floor of the loft a few feet inside of the barn. It was here they decided to build a nest. 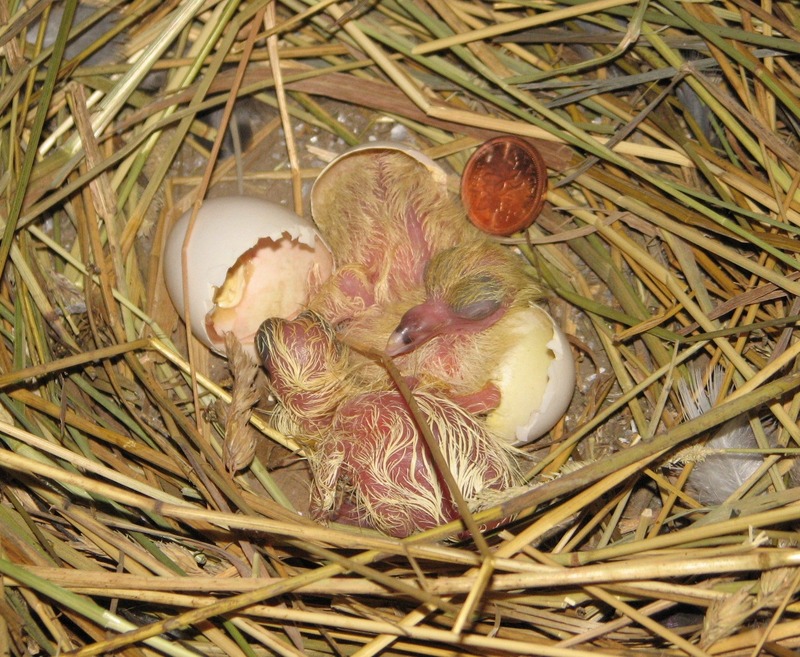 Today the eggs cracked open and out popped two little chicks. I placed a penny beside one of the chicks as a reference point in size. 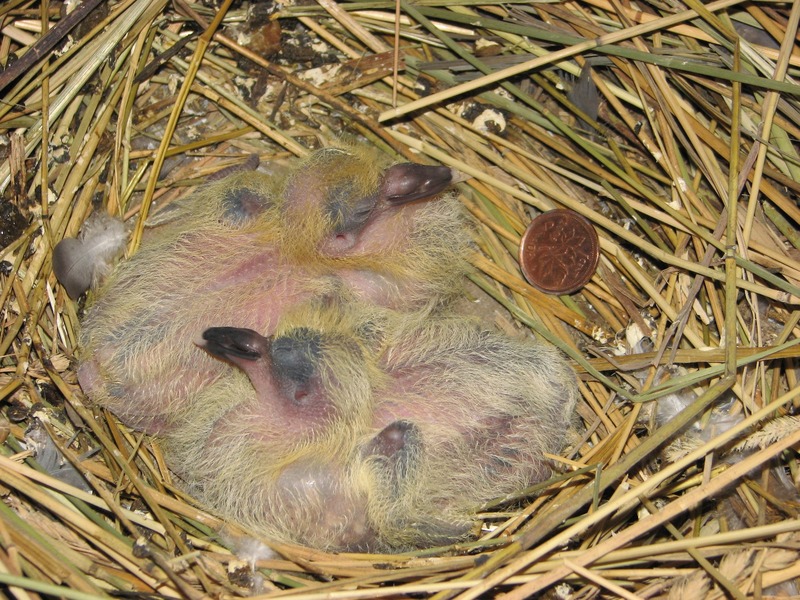 This is the beginning of the miracle of life as we watch these naked babies find their clothes of feathers and rapidly grow right before our eyes. I took a peek at the little ones today and was amazed to see these little fluff balls. 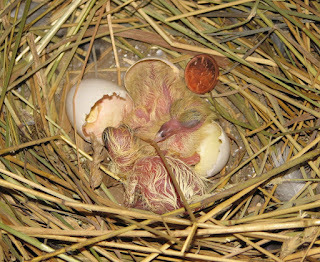 Now that they are dried off, they look a whole lot cuter than when they were first hatched. Bob informs me that our second cut hay needs to go into that loft. 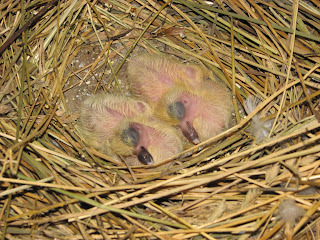 That means I will have to temporarily move them out of the nest when the time comes. I just hope mom and dad don't "fly the coop" and abandon them. 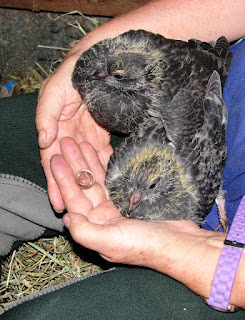 I don't want to have to raise two more pigeons. Bruiser is sweet, but it is a lot of work. Tomorrow I'll take another picture and you will see such a difference two days makes. Here are some pictures from today. Note the soft yellow fluff of down these babies have now. Mom lets me get within reach of her to see the babies. She's very accommodating to show me her brood. It has been a couple of days since my last post so I decided to take some new pictures of the growing siblings. The transformation is quite outstanding. 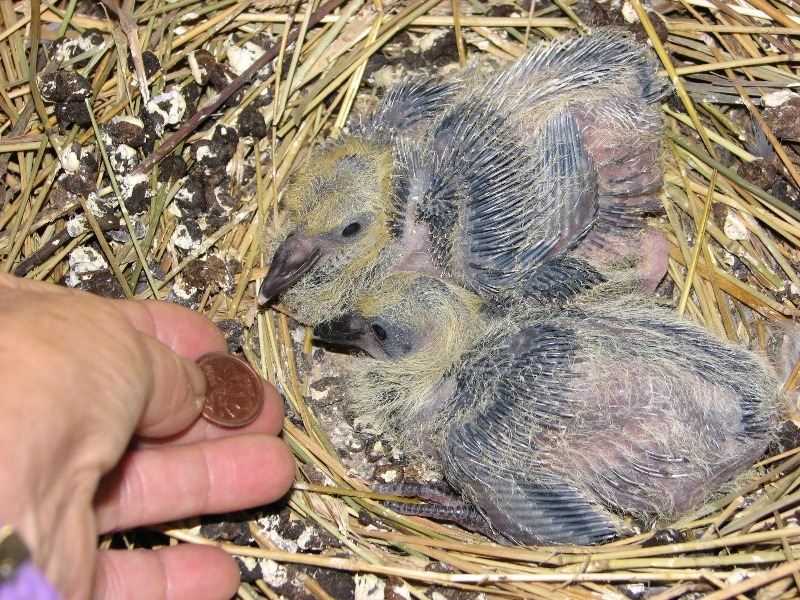 I placed a penny in the nest again for size reference. 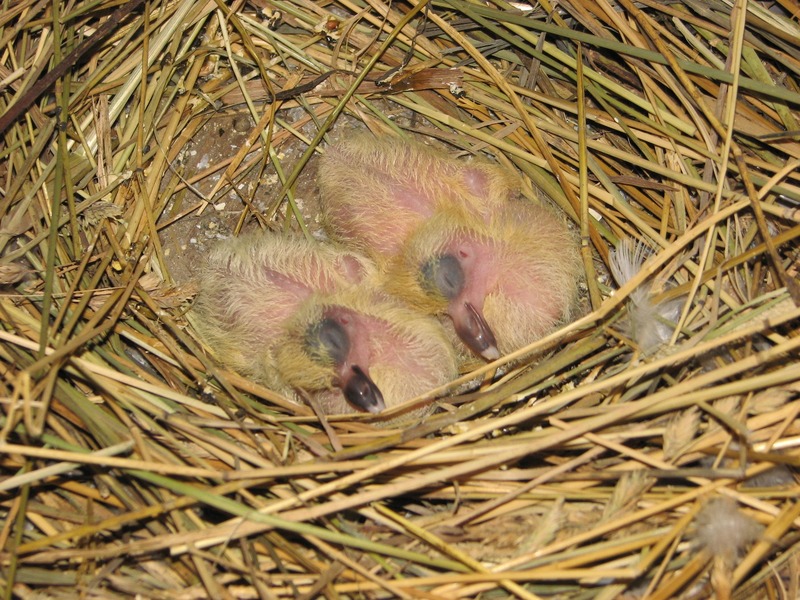 If you compare the photos from day 1, you will immediately notice how much these fledglings have grown. The are pecking now when they feel the vibrations of movement. Their eyes are still closed for now. It was picture day today and now the little babes in the nest can see. Their eyes are open and they are aware of their surroundings. 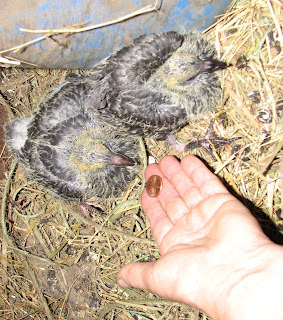 The penny gets lost in the nest with the size of the chicks so I put it in my hand and took the picture in close proximity to the pigeons. Wow! Now they are nine days old. I'm pleased to report that the baby pigeons survived all the activity of hay being unloaded into the loft. We decided not to move them being careful to protect them from any falling bales. The banging and grinding of the elevator most have placed them in some discomfort with the noise. By evening all was quiet and I longed to see the parents return. They hadn't. By morning I was delighted to see mom and dad land in the loft and take over responsibility for raising their young. 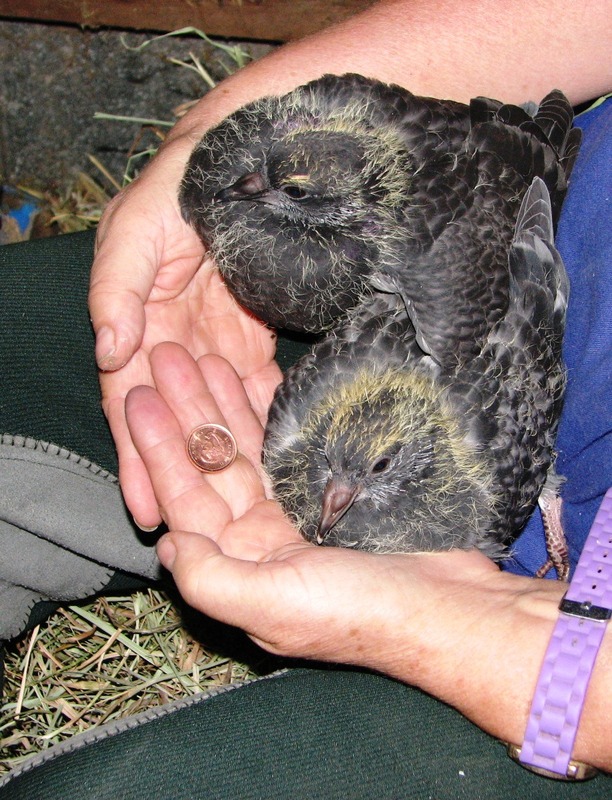 I was afraid they might have abandoned them and I wasn't looking forward to devoting so much time to bringing up two more pigeons. Besides, their real parents would do a much better job teaching them how to be pigeons an survive. The kids are on the move... They have outgrown their nest are are hanging out in the loft staying close by to their former home of rough built straw nest. There are a lot of squeaks lately coming from the hayloft. They are growing like weeds. Tomorrow I will try and flush them out of their hiding spot to get some new pictures. I went to the loft today to take some new pictures of the brood. My, the have grown. It won't be long before they start their infancy flights. 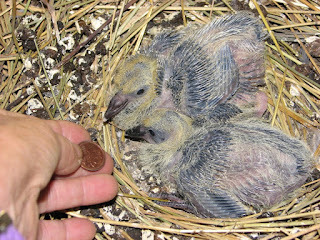 Compare their size to the penny when I first checked the nest when the eggs hatched. I returned home from Atlanta and couldn't believe my eyes. The little pigeons are all grown up and flying about the loft. They have matured into handsome birds. This will be the last entry on this post as I believe the pigeons will soon venture into the unknown and join other wild feathered angels of the sky.